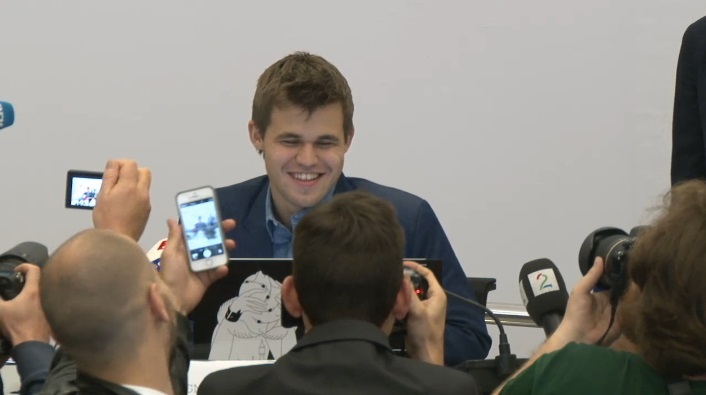 A "happy and relieved" Magnus Carlsen's reign as World Champion will continue for at least another two years after a nerve-racking win in Game 11 gave him a 6.5:4.5 match victory in Sochi. 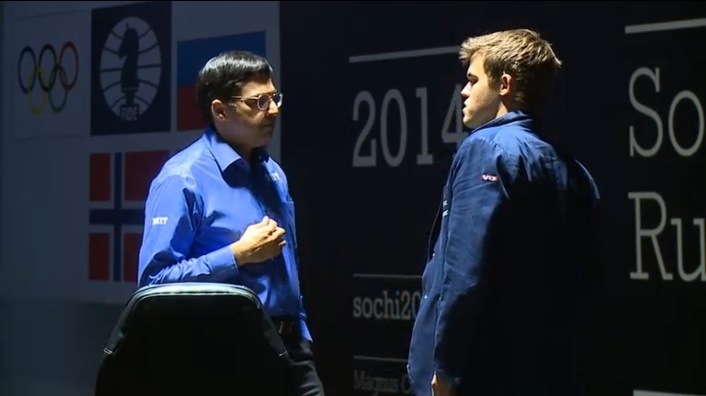 It could hardly have been more dramatic, as Vishy Anand finally came out on top with the black pieces in the Berlin, correctly sacrificed a pawn and seemed to have every chance of leveling the score before the final game. Anand later admitted, however, that his nerves were the first to crack, calling the exchange sacrifice he went for a "bad gamble". Against a lesser player it might still have worked out, but the move was punished with lethally accurate chess fitting of a Champion. I can’t say why I suddenly decided to go for this exchange sac. I didn’t see anything very quick for White, except maybe h4. It was a bad gamble and it was punished… a nervous decision… I wasn’t thinking very clearly at this point. Obviously my nerves were the first to crack. To be honest, the match situation allows him a certain comfort, but in general his nerves hold up very well. I think he’s more stable overall. I played much better. I kept getting interesting positions to play which was not really happening in Chennai. Somehow I had more weak moments than him, which decided the match. In the end I have to admit he was superior. His nerves held up better… He’s obviously very strong. I don’t need to explain that. I have to admit that in this match, all things taken into account, he was just better. I did some things better, but I did some worse. Journalist: After this match are you considering leaving chess? Happy and relieved. It was a tough match almost from the start and today was one of the toughest days of all, but so happy I managed to pull through. I didn’t really want to come back for a 12th game with Black. In general I’m a believer in material so I like to grab it instead of giving it up. I was fairly happy when he played that move since I thought he shouldn’t have enough compensation. I thought after other moves he should be doing fine. I think after he gave up the exchange I played it very forcefully and he didn’t have any chance… I was happy with my 29th move Nh5, trying to play f4 and evict his bishop from e6 – by far his strongest piece. I was a little bit nervous and towards the end I got a little excited so I had to try and control myself there. You’ve got to focus on the game. It’s hard when you’re playing such an important game and the position is not under your control. There definitely were nerves, though I do think I handled them better than he did. I thought after the first couple of games I was playing much better than he was, but then Game 3 got me back to earth again. This time I played 1.e4 in every game and the Berlin Defence has been his main opening for years. Actually from a long time ago I’ve thought that the Berlin Defence quite suits my style with both colours. That’s maybe why I’ve played a lot of these endgames. My play was inconsistent, but it was good enough… For sure he played better than he did the last time. I thought before this match there was no way Anand would come back and play another match, so I wouldn’t venture to guess. It’s a long time ahead. No, I’m already a little bit sick, so I shouldn’t do that. We'll of course keep covering the aftermath of the World Championship, while to fill the chess vacuum we have the Aronian-Nakamura match in St. Louis!